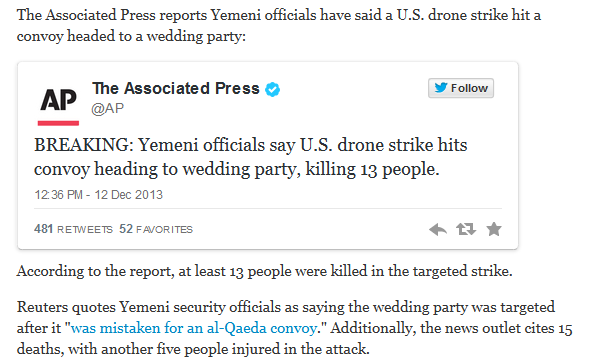 Obama HAPPENS when the precedent BlowOut is the destruction of Yemen's "Ministry of 'Defence' "! Mercy! All of this is enough to make some weak-minded folks or even people with a particularly suspicious nature begin to wonder if everything our government tells us about ongoing operations around the world isn't the gospel truth. Good thing none of us is like that, so we can safely ridicule or pity anyone who thinks otherwise. ... only downgrades will have human intelligence????? well one of the reports said they killed a bunch of people "SOME of whom may not have been terrorists.."
so so sad about those but they probably deserved it for marrying terrorist daughters. How's breakfast working for you? The New York Post has its usual "holiday spirit"
Still comes with a side-order of homophobia! Or maybe you just stop rolling out bad product?